Voluntarily apply to be struck off the companies register. Be wound-up by a liquidator under a compulsory or members voluntary liquidation. The route taken depends on the facts and circumstances of the case. Striking off is the process in which a solvent company is dissolved and struck off the Companies Register. It is often known as "dissolution". A company may be struck off the companies register by the registrar of companies if it is not carrying on any business or operation. The company must be solvent and the directors complete form DS01 to apply for striking off. If the company retains any assets including share capital these will become Bona Vacantia and the property of the Crown when it is struck off. A Capital Reduction is essential if the company is to be struck off and has more than a small amount of share capital or capital reserves.The 2006 Companies Act permits a simpified Capital Reduction procedure to repay share capital and non-distributable capital reserves to shareholders. On making a Capital Reduction, the directors must sign a Statement of solvency . Where a company has not discharged all its debts or is insolvent when it is struck off, it may be returned to the register. The directors may be held personally accountable to its creditors. A repayment of share capital is not a distribution. A distribution of up to £25,000 to shareholders on striking off is treated as capital for tax purposes. Where assets are in excess of £25,000 capital tax treatment may be obtained by using liquidation instead of striking off. Liquidation is a process by which a company is wound up by a licenced insolvency practitioner under the Insolvency Act 1986. Once wound up the company is removed from the register. Liquidation is generally more expensive than striking off because it must be conducted by a licenced insolvency practitioner. Liquidation is the recommended way to wind up a company if its affairs are complex or where the value of assets exceeds £25,000. Liquidation by compulsory order of the creditors is often unavoidable when a company becomes Insolvent. Once wound up a company cannot be restored to the register after more than two years. Caught by Transactions In Securties rules and subject to Income Tax. Caught by the Targeted Anti-Avoidance Rules (TAAR) that applies to phoenixing and results in the distribution being subject to Income Tax. If not caught by the above, whether the capital distribution meets the conditions to qualify for Entrepreneurs' Relief or Invetors' Relief. The date of the distribution will be the date of disposal or date of receipt for any capital gains tax or income tax computation. This means you may have more than one disposal date for capital gains tax and may need to carry out a Part disposal calculation. A company may be left dormant with or without assets. It will still be required to file accounts and a confirmation statement (previously known as an annual return) with Companies House. HMRC will require the company to notify it of its dormant status, otherwise the company will have to continue to file Corporation Tax Returns. Once a company ceases trading and becomes dormant its shares lose potentially lose status as business assets, this may affect Entrepreneurs' Relief and Inheritance tax (IHT) Business Property Relief for shareholders. The registrar of companies may apply to strike off a company which is evidently dormant. It is normally not possible to execute a Purchase of own shares if the company is known to be ceasing trading: the purchase will not serve a trade purpose and HMRC is unlikely to grant clearance. A purchase of own shares may be Combined with a capital reduction: again it would be expected that the company would continue to trade for a period after this in order to satisfy HMRC of a trade purpose to the transaction. See Purchase of own shares/capital reduction checklist. Profits may be extracted by Dividends. The company may have non-distributable reserves, it will then need to consider executing a Capital reduction to distribute capital reserves so that funds may be passed to individual shareholders as dividends. This will suit basic rate taxpayers. Higher rate taxpayers may prefer to receive capital if possible because of the lower rates of CGT. In the event of striking off up to £25,000 may be distributed as capital for tax purposes. Any balance in excess of this is taxable as income and so may be withdrawn as a dividend. Provided that qualifying conditions are met, Capital Gain Tax Entrepreneurs' Relief may apply to capital distributions received by directors or employees. Once a liquidator is appointed all distributions made by the liquidator during the winding up process are normally treated as capital. This means that liquidation is used in most cases where a company's reserves exceed £25,000. Provided that qualifying conditions are met, Capital Gain Tax Entrepreneurs' Relief may apply to capital distributions received by directors or employees. There are some potential issues where a company has excessive cash balances to its needs, see Surplus cash CGT & IHT relief. Stamp duty land tax does not apply to distributions in specie made by a liquidator. Any overdrawn directors loan accounts will need to be dealt with in such a way as to result in repayment, not waiver, in order to ensure income tax charges are not inadvertently triggered. See Directors loan account toolkit. A repayment of share capital or share premium: TIS tax clearance is now recommended in respect of all repayments of share capital and share premium. A distribution in respect of securities on a winding up. Up to 5 April 2016 a distribution made by a liquidator was not normally treated as a TIS unless it were combined with another transaction such as an issue of shares. Under the new rules tax clearance may well be recommended prior to winding up a company. A Targeted Anti-Avoidance Rule (TAAR) has also been introduced to target ‘phoenixing’. Broadly distributions on a winding up will be taxable as income if within two years the individual (or someone connected with them) carries on a similar trade or activity. This expanded definition and TAAR will not extend to a Distribution on striking off, where the £25,000 limit mentioned above will instead apply. If you like our site, subscribe to unlock the full content (you can also use that link to sign up for our FREE newsletter). 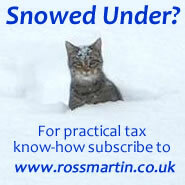 Need more help, please contact our Virtual Tax Partner Support service.